Weekend Freewrite- 2/22/2019 - Part 1 - The First SentencesteemCreated with Sketch. As many of you know, the weekend freewrite is a different beast if you do the three prompt option. Have fun!! And remember - you always can do a single prompt. Look for the red graphics. If this is the first time you came upon one of our freewrite posts click here to read the original post. If you want to do the single prompt, use one from the compilation. This is the process: You get a prompt. You set a timer and start writing right away, without thinking what you want to write, without stopping. Write for 5 min about whatever that prompt brings to mind. Throughout the years, I have been part of several freewriting groups and found The Writer’s Toolbox to have great prompts. Some are a bit far-fetched which makes it even more fun to use. This is how the weekend free write is different. You get 3 prompts and write 5 minutes on each prompt creating one story. Each prompt is in a separate post. No peeking!! The First Sentence prompt will always have the green graphic. The second prompt is- The interference. It will direct your story into a new direction. Write for 5 more minutes. The second prompt will always have this graphic with a yellow background. The third part is a dramatic twist. Continue writing where that prompt takes you but still creating one story. Write 5 more minutes. The Dramatic twist prompt always has this purple background graphic. As always, don’t judge your writing and just see where it will take you. If you have time and later want to polish your piece, feel free. But remember that part of the 5 minutes deal is to make it possible to do this on a regular basis. Prompt First Sentence: I decided to watch my neighbor all the time. Dog poop on the lawn means that I need to teach him a lesson. This is your first sentence. Continue writing the story presenting itself to you. Find the second prompt - yellow graphics. When you have finished your story using all three prompts (5 minutes each) leave a link to your post under the last prompt. this weekend freewrite. That made me realize that if you haven't been taking writing classes or have been around a writing community this kind of prompt writing might feel very weird. Here is a bit more of an explanation: The several prompt approach to freewriting is an exercise to take us out of what our usual thinking pattern and open new neuropathways in a sense. It forces us out of our comfort level and we write in a style or genre or about topics we never would on our own. A second prompt makes us explore a completely new direction and challenges us to connect the story. The third prompt forces us to once again to shift directions and figure out how to bring this story together and to an end. It is kind of like driving to work on a familiar road. But suddenly, there is a detour and we end up driving through new neighborhoods and seeing all kinds of amazing things we never knew were there. We often get stuck in shoulds and what we were told by a parent or teacher what a story, or writing, needs to be like...... you fill in the blanks. Or we just write that what we are familiar with. This kind of freewrite helps to open the creative forces and let go of any restrictions we put on ourselves.. I use prompts taken from books, suggested by other freewriters or created by me. Writers, please use the hashtag #weekendfreewrite as one of your tags. 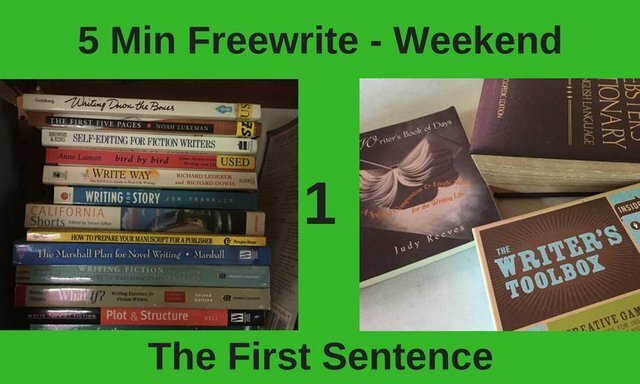 If this is your first weekend - use the hashtag to see some fabulous examples of past weeks freewrites! !